In the north of the country, you will find more meat dishes, as pork, chicken, turkey and veal. However, Istrian and Dalmatian cuisine will present you something else. Traditional Dalmatian cuisine is based on fresh fish and seafood, olive oil, season vegetables and variety of wild herbs. Laurel is almost inevitable, as well as rosemary, basil, sage, parsley and garlic. The most often dressing for the meals and salads is virgin olive oil and Adriatic Sea salt. Most of the meals have only few ingredients, herbs, Adriatic salt and olive oil. Unpretentious but inspiring are the best words to describe it. Croatian cuisine is a melting pot of the best from Italian, Austro-Hungarian, Ottoman and domestic cuisine. If you drive through Croatian coast from Istria on the North to the Cavtat and Konavle on the South, you will notice lots of olive trees and vineyards. This route will make you try fabulous vines and dishes with high quality olive oil. Try to take a drive from Hum in Istria where you can try Fuži with truffles, then to Skradin where you will be served with variety of fresh fish. Continue to Trogir and you will try the best shrimps ever. In Komiža on Vis island try famous stuffed bred under the bell, and on Korcula island their extraordinary white wines. To try Croatian red wines visit Pelješac peninsula and order a glass of Dingač or Postup. In each meal you will taste salt and olive oil produced on traditional ways. Do not bother to ask for organic food. All you will get is answer that everything here is traditional and therefore organic in the best way. Maybe your meal won’t be served in the nicest porcelain plates and you won’t be served by waiters with French manners – but the food and vines you will try will make a mence. Our tip: Next time when visiting Harrods in London, look for Croatian Extra Virgin Olive Oil with golden leafs. This oil is of course eatable, but due to its price (£750), usually used only as a final décor to the dish. It is the only Croatian product you can buy at this world’s famous shop – but only for now. When visiting Croatia try to taste as much of domestic food, because, after all, pizzas and stakes you can order anywhere. Remember to combine this top Croatian dishes with wines from most famous vineyards in Croatia on Pelješac or Istria peninsula! The best way to start your meal is to order Istrian Prosciutto and cheese as a starter. Then order Fuži with truffles. Of course, do not forget to add a glass of wine. Appreciation for truffles started in Roman age centuries ago. Common belief says that truffles are grown as the result of God Jupiter throwing a lightning to an oak tree. 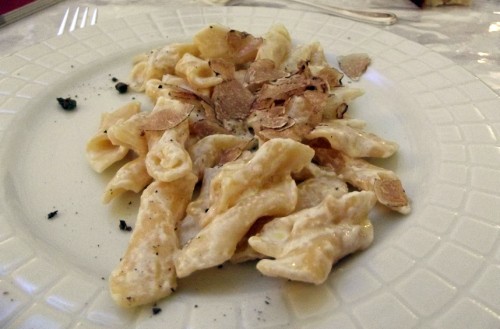 Istrian truffles are among most expensive in the world, with white truffle leading on the list. The best ones grow in deep oak woods of Istria under the oak trees. Specific soil gives them unique aromas and scents that makes them highly appreciated in the gastronomy all over the world. Istrians usually serve them with Fuži – homemade pasta in an Istrian way. Our tip: Enjoy the best Istrian Fuži with truffles at restaurant Stari podrum in Momjan while sipping white wine Malvazija Kozlović. To the Kozlovic wine basements is only a short walk away through green forest of Istrian hills. You can also try authentic ones in traditional restaurant Humska konoba in the world’s smallest town Hum, in heart of Istria. To remind you: Hum is listed as one of five places in Croatia with soul on our list. Did you know: Truffles grow 10-30cm underground, which makes them almost impossible to find. It is not possible to plant white truffles at all. Most efficiently way of finding them is with help of special trained dog or even a pig. These two animals are best known for their subtle sense of smell. Octopus is like a sea chameleon. It can change its colour – from red to grey, yellow, dark and dark-green and the arms can reach a length of 3m. When octopus feels danger it simply discharges black liquid that muddies the water and creates the opportunity for escape. It can be prepared on many different ways, even as a cold salad but octopus under the bell is a real treat! 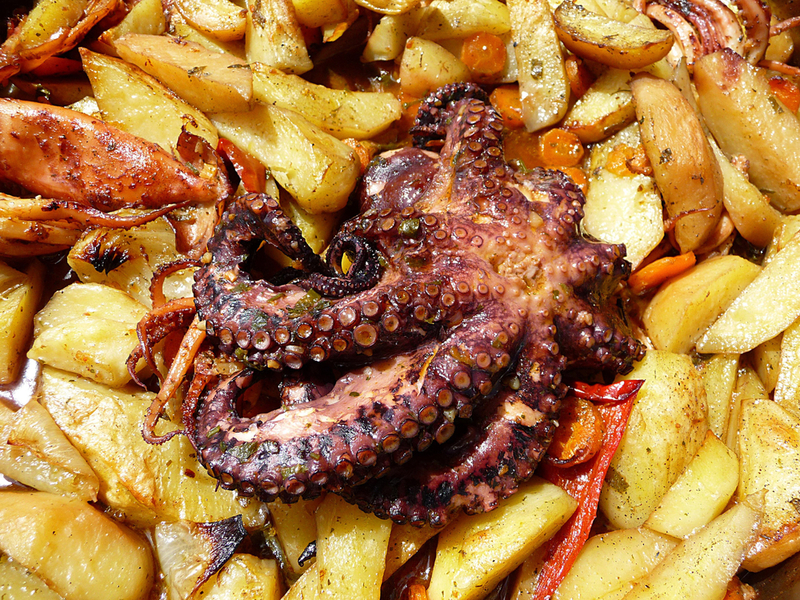 Main ingredients are octopus, potatoes, only a drop of olive oil and wild herbs. Everything is slowly cooked in a cast-iron or earthenware pot. Must be prepared in a fireplace but covered with a bell with hot coals. This kind of baking will colour the potatoes in purplish colour and make them juicy and soft. Delicious aroma spreads as soon as the bell is removed. Order some fresh seasonal salad with it, and do not forget to breathe while eating. Our tip: Enjoy amazing octopus with potatoes cooked under the bell with a glass of rose Saint Hills from Pelješac, take a deep breath and say thank you Croatia! Tasting a glass of rose Saint Hills in Tavern Galija while watching boats sailing into the Cavtat harbour could be a perfect end of your day. Cavtat is also on our list, so do not miss to read more about Cavtat. After reading more about Cavtat next step is to book you apartment there, isn’t it? Search for best apartment in Cavtat! Did you know that octopus is the only food that is even better after freezing and which is not to be eaten fresh? When frozen before cooking, it is softer and juicy. Croatians do not like rise so much. Nevertheless, try to serve black risotto to the greatest rise hater – he will not only eat it but also ask for more. Cuttlefish or squid are one of the main ingredients here. Its ink gives a unique black colour to the rice but also a delicious taste. Near the end of the cooking process, cuttlefishes’ ink sacs are poured over the rice colouring it. For even better flavour grate some cheese over, pour a glass of local Pošip wine and enjoy! 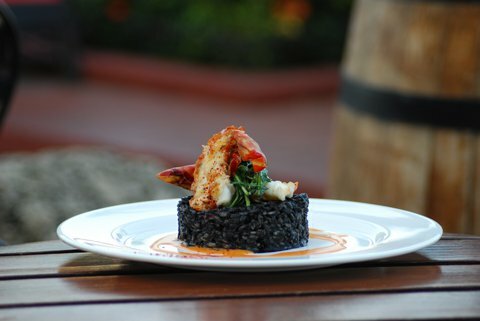 If you love food, the sea food especially, you will fall in love with this black risotto! Our tip: Order one at famous restaurant Kapetanova Kuća in Mali Ston right on the entrance to Pelješac Peninsula. This time eat like Croatian and ask for more! While in Ston take a moment to stop by and check how the salt is being collected in one of the oldest Salt pans in Europe. The process and the shape of pans are just the same for almost 7 centuries. You can also try fresh oysters just picked from the sea. Also, take time to check out our private apartments in Dubrovnik area. When stating that oysters are one of the most famous aphrodisiacs, the question Did you know is completely unnecessary here. Pogača is domestic stuffed bread. It is based on salted fish as anchovies, olives and herbs. Its tradition goes centuries back to the times when Greeks came to Vis Island. Following tradition, it should be baked under the baking bell. If you visit Vis without trying Viška pogača you will regret it for sure since this is one of the most interesting authentic Croatian dishes! There is no room for frozen fish from supermarkets, as fishing is more than tradition for Vis inhabitants. The coexistence of the man and the see is unbreakable here. You can eat magnificent Viška pogača on island of Vis and only few restaurants outside the island. If not visiting Vis, definitely try one at Uje bar in Split. Komiža on Vis island is one of our 5 places with soul in Croatia, so read more about Komiža. In case you decide to visit Split we are sure we can offer you wonderful apartments in Split. 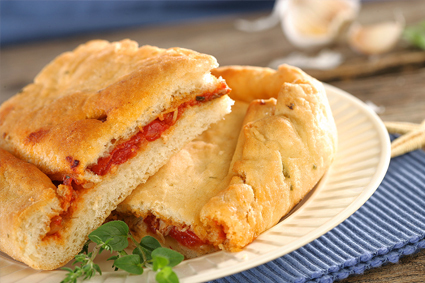 Did you know: Another version of this bread is one with tomatoes added making it similar to pizza, but better. While having a bite just imagine eating pizza Napolitana in 3rd century in small Mediterranean island city ruled by the Greeks. Just like eating part of culinary history, isn’t it? It is a wonderfully, beautiful and messy dish. It is made from Adriatic shrimps stewed in a tomato and white wine sauce. Buzara represents slowly cooked tomatoes and garlic with herbs, and olive oil in lot of water, bit of white wine and various types of seafood. Because of its simple preparation, it is most appreciated dish among fisherman. 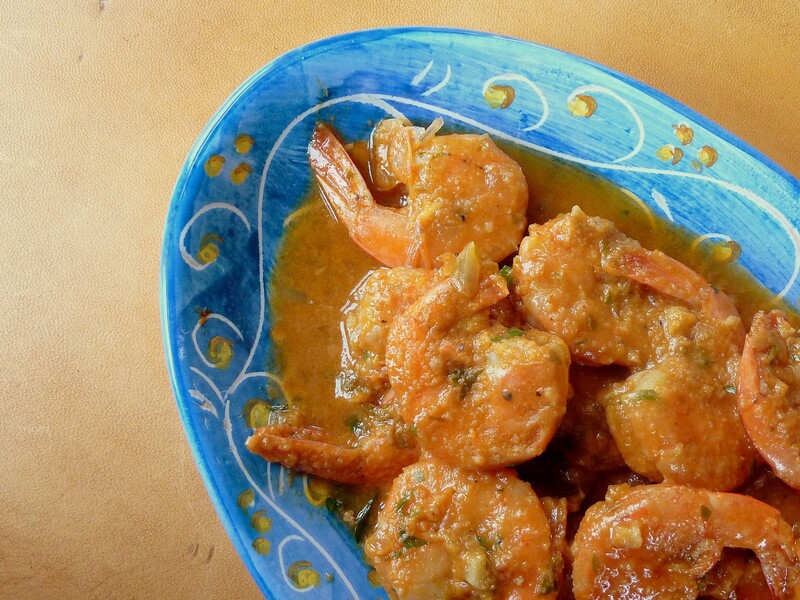 Buzara can be done with other seafood too, but Buzara with shrimps is something special. Once you try it this way, you will never choose another one. Shrimps are true gem of the sea, top delicacy for everyone, even ones who do not prefer seafood on their plate, so don’t miss it! It is served in a large bowl with lots of soup. Do not be surprised when waiter brings you bib for adults and another smaller bowl with water and lemon. You will need it to clean your hands, as dinner set is useless here. Do not finish eating meat from the tails only. The meat in the head of shrimp is even more juicer. Out tip: Do not feel embarrassed to dip your bread in buzara sauce. It is delicious! Also, if you wanted to propose your love one, wait till she is finished eating buzara. When we say it is messy – trust us. At Frankie restaurant in Seget Donji near Trogir you will find the best Buzara with shrimps you can get! More about beautiful town Trogir. Visit our website to find cozy apartments in Trogir. Did you know that frequent meals of shrimp and other seafood can have positive effects on mood and avoid depression? To prepare food under the bell is most appreciated way of cooking in Croatia. Moreover, lamb is one option. Forget eating it any other way, taste of roasted lamb under the bell simply cannot be compared. Lamb and vegetables are baked with bit of oil and some herbs under the lid. Fireplace fire melts herbs and meat juices together creating specific aroma. Not completely cooked or roasted, but just perfect. Before this you won’t need any starter. Just ask for some seasonal salad and “pogača” bread. Make it complete with local red wine from Pelješac peninsula – Postup Donja Banda. It will just melt in your mouth. Out tip: Make a phone order before coming to restaurant. Preparation time is about 2h so this way you will avoid starving while waiting. Do not worry, it will not be weird, locals do it all the time. You just make sure to come hungry enough! We recommend you to visit restaurant Monković close to the most southern town in Croatia on our list – Cavtat. Find beautiful apartments in Cavtat or in Dubrovnik area! Did you know that fireplace used to be the central point of every home? It was the place where meals were prepared and where family would gather. It was also the warmest place in the house in winter. fashion its dome. but slice a lot old totes on to recycled plastic wool and you will be ready to knit up this easy tote modeled to a dish to receive coupons.